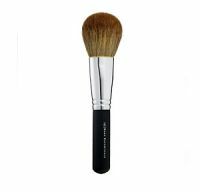 Although I hate the loose mineral powders, this is a good brush. I use it for my pressed or baked blushes, and it does a good job. I got this in a set. I usually use the handy buki though. This works well, but I'll stick with my buki. Same problem I've had with the buki is that the bristles come off. It does work well to blend and cover your face. A friend gave me her extra BE full flawless application face brush, so I figured I'd give it a try. PROS: None... CONS: Bristles aren't that dense. Natural hair bristles are a bit scratchy. Some shedding. Expensive. Don't waste your money on this brush! Get a better face brush from Ecotools or Clinique or just about any other brand!